How much does it cost to travel to Oviedo? How much money will you need in Oviedo? €56 ($63) is the average daily price for traveling in Oviedo. The average price of food for one day is €17 ($19). The average price of a hotel for a couple is €64 ($72). Additional pricing is in the table below. These average travel prices have been collected from other travelers to help you plan your own travel budget. Oviedo is the capital city of the Asturias Principality in Northern Spain. It is a city of churches and cathedrals with many of its buildings designated as UNESCO World Heritage Sites. Its old town, or Casco Antiguo, is the most historic part of Oviedo, where many of the UNESCO sites are situated. 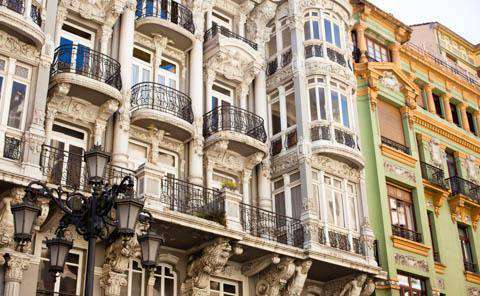 As mentioned, some of Oviedo's most notable sights are located in the Casco Antiguo part of the city. The Valarde Palace from the 18th Century is one of these outstanding buildings, and now houses the Asturias Museum of Fine Arts. The Town Hall and Plaza del Fontan are also sights to see as are the palaces of Torero and Camposagrado built with the grandeur of Neo-classical architecture. The Cathedral of San Salvador is another landmark that makes its home in the old part of the city, standing primarily in the Gothic style with some pre-Romanesque sections visible as well. Located on a hill just outside the city, you can also visit the quaint little pre-Romanesque churches of San Miguel de Lillo and Santa Maria del Naranco. A city of cathedrals, Oviedo even has a church museum of archaeological artifacts housed in the cloister of the old Convento de San Vicente. The convent was founded in the eighth century and rebuilt in the 15th, and now displays items like ancient Roman coins, sculptures, mosaics, and other artifacts of the Roman era. For the art enthusiasts another great museum is Oviedo's museum of fine arts mentioned earlier, which resides in the Velarde Palace. The collection includes artworks from the Renaissance and Baroque periods as well as paintings by contemporary artists of the Asturias region. If you seek a little green escape from the bustle of the city, the Parque San Francisco is one of the biggest parks in Oviedo, complete with lush gardens, winding paths, glistening ponds, and even some wandering peacocks. Being the capital city of the Asturias region, Oviedo is home to many places that merit as UNESCO World Heritage Sites. Most of these can be found in the old part of Oviedo, called the "Casco Antiguo." Here the cobbled streets are lined with beautifully restored buildings and squares, some of which include the Velarde Palace, the Town Hall, the plaza del Fontan, the Palace of Torero, and the Palace of Camposagrado. Old town is also full of small traditional shops, an open-air market, and plenty of options for dining as well. One could spend days upon days visiting the churches and cathedrals of Oviedo. Once you wandered the ins and outs of the historic district, explored its markets, and indulged in the local dining scene, it is hard to imagine that the city could have more to offer. Depending on the time of year, there are plenty of local festivities that have much to offer in local food, folk groups, traditional costumes, crafts, and more. Some of the more notable festivals include the Fair of La Ascension sometime in May, La Foguera de San Juan on the night of June 23rd, and the Fiestas de San Mateo which includes plays and concerts scheduled for the week leading up to St-Mathew's Day. Northern Spain is a place where seafood and fish are common staples. The Spanish word for seafood is "Marisco," and some popular shellfish shellfish include "centollo" or spider crab, "necoras" or velvet crab, "percebes" or goose barnacles, and mussels. Pulpo a feira is another common seafood dish of octopus prepared with oil, salt, and hot paprika. Then there are empanadas-pies made with traditional dough, then filled with onion, pepper, and some meat, usually tuna, veal, or seafood. In Oviedo, as with most of Asturias, there are a few common dishes worth mentioning which include a type of bean stew called Fabada Asturiana, a strong local cheese called cabrales, a kind of rice pudding called arroz con leche, as well as cider (or sidra in Spanish) that is renowned in Spain. There are many cider restaurants where you can also get tapas and traditional food located in calle Gascona also known as "Cider Boulevard" or "Bulevar de la Sidra." Asturias Airport is located near Aviles and has easy access, by bus or by car, to and from Oviedo. The airport has flights to and from London, Stansted, Amsterdam, Brussels, Lisbon, Milan and Rome, Basel, Zurich, and various destinations in Germany. Within Spain there are flights to Madrid, Barcelona, Valencia, Malaga, Alicante, Palma de Mallorca, Sevilla, and the Canary Islands. The bus from the airport is operated by ASLA and will take about 40 to 50 minutes to reach Oviedo. Taxis from the airport to the city are also available and will take about 20 to 25 minutes, though this option will be more expensive than the bus. The Oviedo Coach and train stations are location right next to each other just west of the city center. The taxi stand is in the same vicinity.